Its origins date back to the second half of the 15th century and it was rebuilt in Renaissance style in the 17th century. The Baroque altar from the end of the 17th century with the painting of All Saints dominates the interior of the church. Formerly, there was a low Gothic altar. Only one wing with the paintings of St Peter and St John the Baptist was preserved. The original central part of the altar, a painting of Bemoaning the Death of Christ from the 15th century was moved in 1919 to a museum in Budapest. The interior of the church was finished in the mid-17th century. 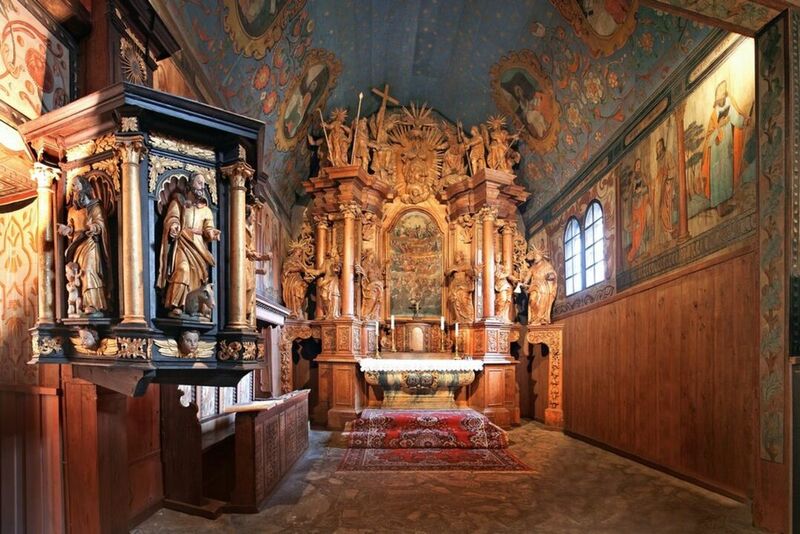 Viewing the church, especially the paintings of the Apostles, the Late Renaissance pulpit with figures of the Evangelists from 1654, and a painting of St George mounted on a horse fighting a dragon (a distemper painting on wood from 1653) will draw the attention of any visitor. The wonderful dome paintings (a sky with stars, angels and a panelled ceiling) complement the Gothic mysticism of the space. Highly artistic and expert reconstruction and restoration of the church was awarded a prize by EUROPA NOSTRA in 1993 and the church itself, as the National Cultural Monument, was included in the List of European cultural heritage.